Today Harley-Davidson announced a plan to ride back to relevance on the saddles of some new bike designs and new stores. I don’t think it’s enough. Not even close. Harley’s new-for-2020 lineup will include an off-road adventure bike, a high-performance streetfighter and an electric motorcycle. All of which represent huge departures from what the brand’s now known for: archaic luxury bikes. The company also apparently plans to diversify its product distribution situation, with “better dealerships” and fancy new storefronts in cities. You’d know all this already if you read our news post from earlier today. But the more I think about Harley’s strategy, as announced, the less I think it’s going to work. Harley-Davidson is clearly trying to preserve its image as a premium brand that sells expensive hardware, while attempting to appeal to people outside its fanbase of “sleeveless leather vested tough guys” which we all know has been deteriorating to “mid-life-crisis-having dentists cosplaying as sleeveless leather vested tough guys” for years. The problem with having a brand built on the image of “rebellion” that only sells really expensive stuff is that the above-described situation was inevitable. The Harley-Davidson brand has been hijacked by posers, partially because even the cheapest new Harley is way too expensive for actual rebels. That’s become so obvious that even the wannabes want to stay away. But at this point it wouldn’t matter that the Harley ridin’ rebel look has been co-opted by real estate agents and middle managers, because chain wallets and MOM tattoos aren’t exactly edgy anymore no matter who’s wearing them. What Harley’s doing now, wriggling away from the Hell’s Angelesy associations and leaning into the “premium” side of its appeal, it should have done decades ago. Putting H-D products into fancy malls, or making “new retail formats—including smaller, urban storefronts globally to expose the brand to urban populations and drive sales of the expanded Harley-Davidson product portfolio and expand international apparel distribution,” as the company put it, probably seemed appealing because it seems to be working for Tesla. But Tesla is new and hot and combines something most people need (a car) with something most people are already obsessed with (their phones) which gives the brand an easy and inherent draw to foot traffic. Who’s going to be enticed into a Harley-Davidson store between H&M and Victoria’s Secret? I mean, maybe if it’s next to Tommy Bahama, but that just brings us back to the point about who’s still hanging on to the brand. 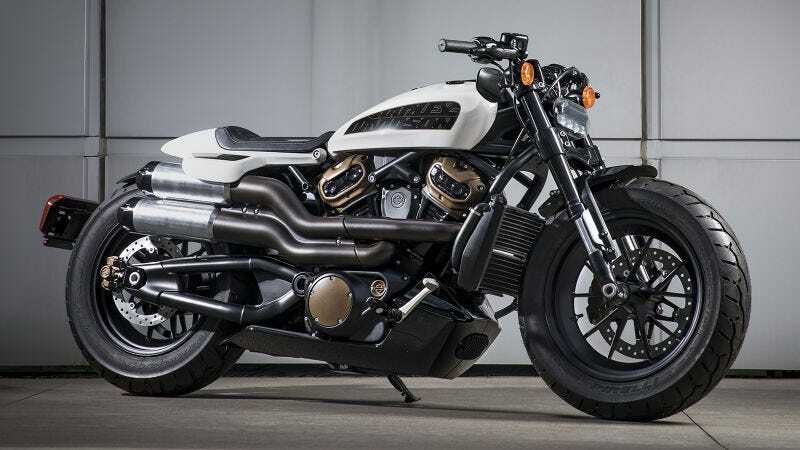 The Pan American adventure bike, streetfighter and LiveWire electric bike prove that Harley doesn’t know how to be cool. And like I said in my earlier post, I want to reserve judgement until I actually ride one, but the fact that an off-roader and a cruiser and a street performance bike share a platform doesn’t send a strong message to me that H-D is really interested in product innovation. From where I’m sitting, it looks more like the company just identified what’s popular and is trying to jump on multiple bandwagons as cheaply and efficiently as possible. And how many people are really going to take a chance on an unproven adventure bike like the Pan America or sport naked bike like the Streetfighter when there are so many excellent established options in the mix that will, most likely, cost less? I’m not hearing any crap about the LiveWire electric bike being innovative, either. That’s not innovation, that’s just an engine swap on the same aesthetic the company has clung to for as long as I’ve been alive. It’s going to cost a fortune and it’s going to look like every other Harley. It might attract tens of new people to the brand, but it definitely does not count as trailblazing. Harley’s in a uniquely challenging position these days. It’s doomed if it doesn’t shake things up, but a big and old company is not going to want to take risks and do something unorthodox, which I might argue is probably the only thing that could really rebuild the brand’s relevance. A “Harley take” on the types of motorcycle that are hot right now will probably prolong H-D’s life a bit. But the brand’s not going to get its groove back by pushing apparel and altering its dealership experience. It’s got to give us something we can’t get anywhere else, and actually want. I don’t know what the solution is there, so I guess it’s a good thing I’m not a product planner at Harley-Davidson. But I would probably start by going smaller and cheaper and what about a generous warranty?